On the 18th of March 1989 Messrs. Price, Parry and I joined a railtour run by the Railway Development Society, which due to unforeseen circumstances failed to cover the more interesting parts of its advertised route. 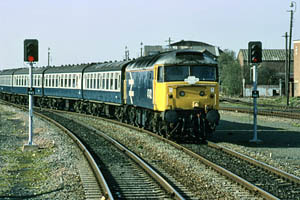 The railtour on 17 March 1990 was organised by the same body to visit freight only routes, two lines in Lincolnshire threatened with closure, and a relatively new section of track at Lincoln. Once again Messrs. Price and Parry set out from Shrewsbury, this time in the company of Green Arrow, travelling on the 0705 Euston train with 47846 "Thor" and DVT 82110. At Wolverhampton the 47 came off and 90001 "BBC Midlands Today" came on at the rear to push. At New Street I joined the party, having already seen the excursion train twice, passing through Wolverhampton and standing at Soho Junction. The train consisted of a mixed bag of six MkIs, carrying Inter- City, Western and Scotrail insignia, and was hauled all the way by 47432, carrying an appropriate headboard. We duly settled in our seats, fortunately at the opposite end to a noisy group who seemed more interested in drinking beer than following the fascinating route. ("I see we've got the Cambrian Coast bashers for company" said Steve). We followed a conventional route for the early part of the journey - via Tamworth - but after Burton-on-Trent we took the right fork at Stenson Junction to travel along one of last year's untravelled highlights. This was the route past Castle Donington power station and on through Trent Junction to Nottingham where we reversed. Retracing our journey towards Trent, we turned right at Attenborough Junction and joined the Erewash Valley main line in a northerly direction through Toton ("wot no 60s?" - Steve again). Mr Parry took the opportunity to snap the magnificent iron Bannerley Viaduct (former GNR route to Derby Friargate). Soon we passed the junction with the Midland Railway Centre at Codnor Park and then turned east off the main line at Pye Bridge Junction. We were now to follow 22 miles of freight-only line through real coal mining territory. At Mansfield, said to be the largest town without a passenger rail service, we passed the football ground where later in the day Shrewsbury Town were to lose 2 - 1. Next point of interest is Shirebrook Junction, still a busy spot with much to see on a working day. We stopped briefly here amid a mass of 20s, 56s, and 58s including 58042 "Ironbridge Power Station". More mines and quarries followed as we approached Worksop by way of Shireoaks Junction, switching at last from former Midland metals to Great Central. The Shrewsbury group would in fact traverse metals of all four pre-grouping "Great"s today. (It was round about this point that 4771 began to wax lyrical about his rail journeys and other activities (!) in the area, including travels on the Worksop - Retford line 55 years ago - ref. Newsletter July 1983! These reminiscences were very interesting and had no bearing on the fact that two of the party fell sound asleep on the return journey.....). We burrowed under the ECML at Retford (impossible in 1935! ), crossing the Trent at Gainsborough and taking the line through Central station passed the small oil terminal - a reminder of the "nodding donkeys" still at work in the oilfield hereabouts. Running through Kirton Lindsey at some speed, we burrowed into Kirton Tunnel (1334 yards) and headed for Brigg and Wrawby Junction. Wrawby is a magnificent location, with a signal box nearly as big as Severn Junction controlling many fine semaphore signals. On now to Brocklesby. The nearby remains of North Killingholme Airfield prompted further memories from Green Arrow (assuredly not flights of fancy...) who it appears flew (in) a Lancaster here in 1945, as a member of the ATC. It was about this point that we passed the chap taking a goat for a walk, on a lead! He seemed to quite unconcerned about either the fishy pong or the cheers from the aforementioned "Cambrian Coast bashers". More wheel-squealing tight curves at West Marsh Junctions (where the driver peered back along the train, as if to check that the coaches were still on the rails) before rejoining the main line into Grimsby. Passing through the station and skirting the docks, we ran on at an alarming speed to Cleethorpes, where we managed to stop well in advance of the buffers! The opportunity now arose for lunch - and despite the encounter with the fish meal factory, the local fish and chip shops did a roaring trade! Returning from Cleethorpes we took the direct line back to Barnetby and on to Doncaster via Scunthorpe, passing several locos at Frodingham including 56093 "Institution of Mining Engineers". Next point of interest is Keadby bridge over the Trent - a rolling lift bridge like the one near Carmarthen, not (as stated in the itinerary) a swing bridge. We paused briefly at Doncaster before setting out on more interesting track - another threatened route, the former GN & GE joint line to Gainsborough, and on to Lincoln. There was something rather pleasant as we drummed along the jointed rails here in our MkIs, watching the lengthening shadow of the train on the flat fields of Lincolnshire. For the last few miles the route runs close to the ancient Fosse Dyke, a canal built by the Romans, and still in use. Closure of Lincoln St. Marks station in the early 80s meant a short new length of track had be be built to enable trains from Newark to enter Lincoln Central. It was via this link, after Pyewipe and Boultham junctions, that we now turned westwards, on Midland rails once again. The level crossing of the ECML at Newark was made without incident, but unfortunately our progress was now subject to delay - it seemed that we were following a stopping service train. As a result we gradually became later and later, being nearly half an hour down at one stage. All in all, an excellent day out - a most interesting 334 mile route - and this time, we got there!